After just 2 1/2 years of marriage (which is actually quite a while in Hollywood years) Ashlee Simpson and her rocker husband of the teen cult band Fallout Boy are filing for a divorce. In a surprisingly sensible and mature tone, the pair have stated that “we remain friends and deeply committed and loving parents to our son Bronx, whose happiness and well-being remains our No. 1 priority. We ask that everyone honor our privacy as we navigate this next phase of our lives.” Ashley Simpson-Wentz is asking for joint custody but claiming primary custody herself of 2 year old Bronx Mowgli Wentz (yes you read correctly his middle name is actually Mowgli) and she plans on changing her name back to Ashley Nicole Simpson. What exactly has happened between the pair who seemed to make the perfect grungy/teen bopping couple has not been disclosed, however they stand by the statement that they “remain friends”. 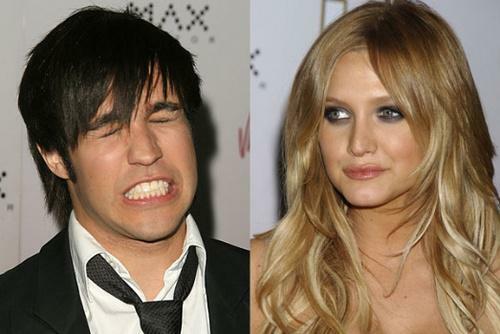 Sources close to the Simpson Wentz family have mentioned that they have been finding it hard to get used to the family, stay at home lifestyle and apparently Pete has still been going out on the town whilst Ashley has been sitting bitterly at home. The split is quite the shock for fans however, who have been living in the illusion of the couple’s on camera affections. Pete tweeted only last week that he was preparing for Valentines Day and wrote, “I guess I’ve got to make them not online,” he joked. “This will be a surprise.” From this weeks news however it looks like this Valentines day won’t be quite as romantic has he had hoped. Their romance appeared to blossom back in 2006, when they were spotted canoodling at a club in New York. They got engaged 2 years later in the fall of 2008. All we can hope is that Ashley won’t follow in her sister Jessica’s footsteps and become a total has been after her divorce, crying out for cameo appearances anywhere and everywhere that will have her!